Hello everyone... Jan's here from handcraft hobby... 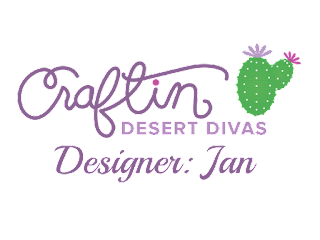 I'm so happy to be on Craftin Desert Divas' Blog today and share my Sneak Peek Project for Treasure Trolls stamp set. Today is day 4 of our Sneak Peek event on Facebook and all new stamps and dies will be ready for your purchase in the CDD Shop at 3pm EST (February 16, 2017). The special this release is FREE shipping with minimum purchase. US customers with $20. minimum order use code: 20SHIP for free shipping. International customers with $40. 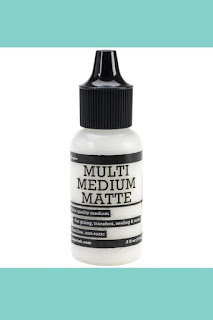 minimum purchase use code: 40SHIP for free shipping. Offer is not valid on previous orders, In stock items only. Offer valid 2-16 thru 2-26-17. 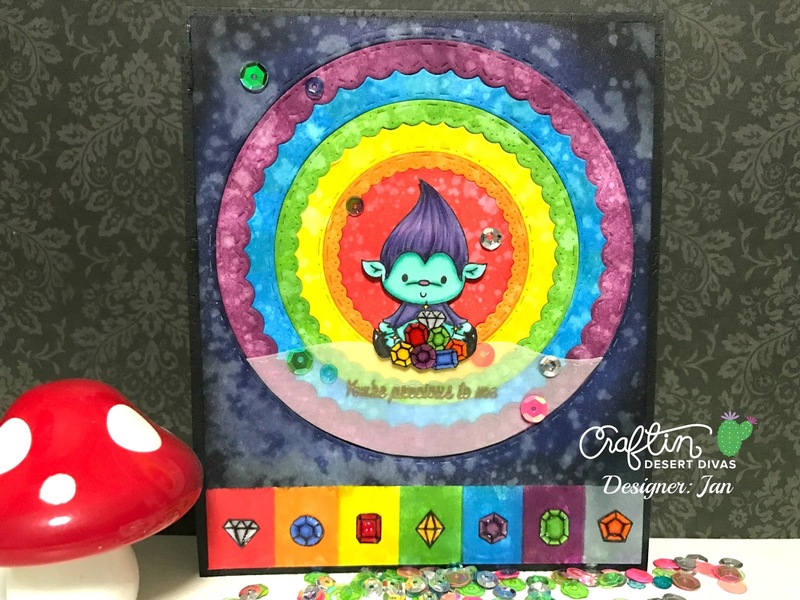 I used our brand new Treasure Trolls stamp along with the latest Inside Scalloped Circles dies to create this card. I cut all the Inside Scalloped Circle dies from main white card stock panel. I carefully seperated them and inked them up with distress ink in rainbow colors order. 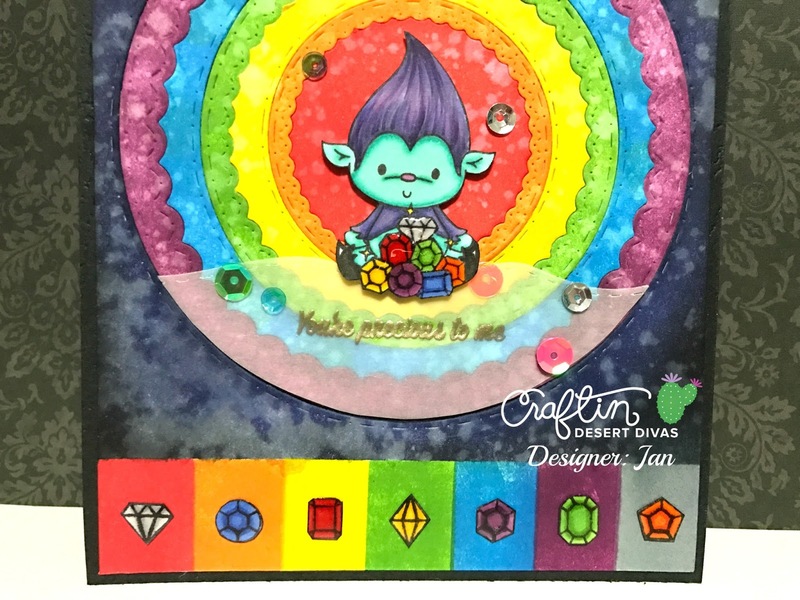 I also stamped this cutie Troll and the pile of gems infront of him and colored them with copic markers then fussy cut it out. I masked of the bottom space and did used the same distress inks for each slot of colors to show cased each gems. I stamped 7 gems images onto white card stock. I colored and fussy cute them out and placed them into each slot of colors. 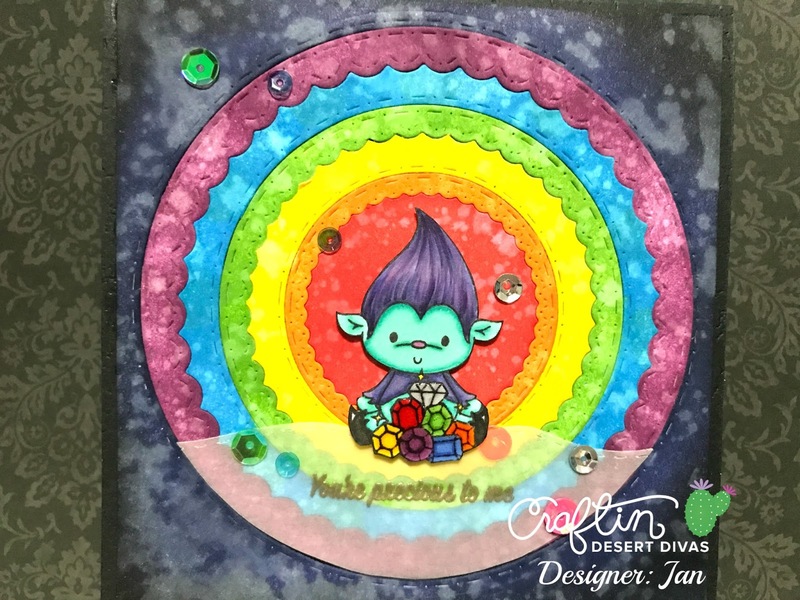 For sentiment, I don't want to cover the rainbow background so I decided to use vellum. I first traced around the circle panel onto vellum paper and cut it out. I used the wavy line from Outdoor Landscape dies to make the hill. I then embossed the sentiment and attached it to my circle panel with Multi Medium Matte. It also served as the ground for the image. I attached my main panel onto black card based and springled our newest Glimmering Gemstones Sequins here and there... isn't it so pretty? I hope you like it and Thank you for visiting... Have a Wonderful day! Wow! 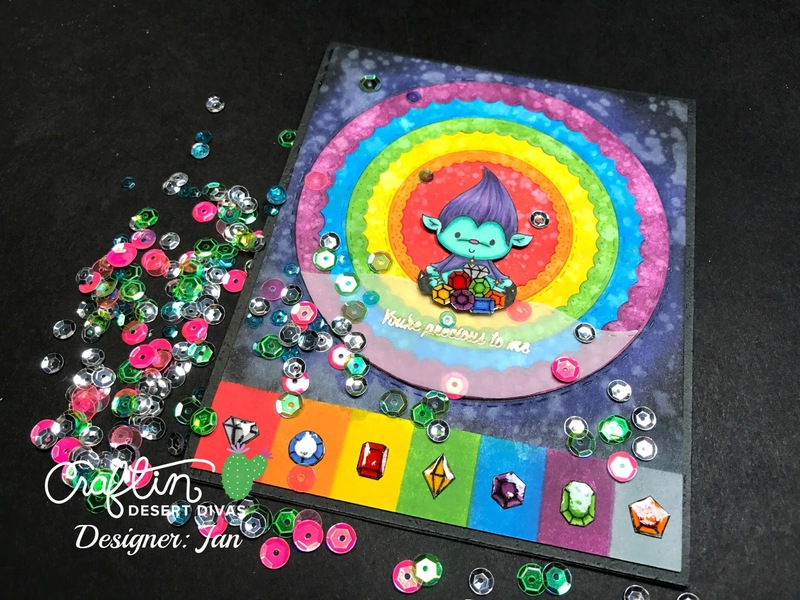 The rainbow coloured die cuts look amazing! I wish I knew how you did it.